In recent decades, there has been growing interest in the role of forests and forest products in climate change mitigation. This has resulted in a number of initiatives such as REDD+, the development of markets for forest carbon, the promotion of green building and other wood uses and many policies to encourage the development and use of bioenergy. While the range of potential mitigation options in the forest sector is quite wide, many countries and regions have tended to focus largely on one or two options in their investments and policy measures. It is likely that this is partly due to a lack of information about the costs and benefits of different options and uncertainties about the feasibility of implementing various policy measures. 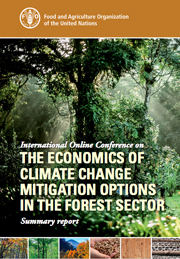 This online conference will explore how a wide range of different interventions in the forest sector might help to mitigate climate change, based on existing country experiences as well as analyses of the costs and benefits of various options under a range of different circumstances. Which option worked well and which did not? What leads to success or failure? What are the barriers in achieving the mitigation potential? What lessons can we learn (e.g. investments and building confidence, policies and incentives, reducing transaction costs)? How these efforts contribute to the sustainable development goals of different countries?